By the way if you are serious about learning Java collection framework in deep and want to master different types of collection classes e.g. List, Set, Map, ConcurrentMap, Queue, Stack, BlockingQueue and other thread-safe collections introduced on Java 5 and 6, then I suggest you take a look at Java Generics and Collection by Maurice Naftalin and Philip Wadler, one of the best books to learn Java Collections. Here is code example to get both first and last elements from ArrayList in Java. It's pretty straight forward, all you need to do is call get(0) to get the first element and call get(size() - 1) to retrieve the last element. In this example, we have an ArrayList of video games, some of the super hit titles of Nintendo era, first element is "Super Mario Bros" while last game is "Race". Let's see how we retrieved these two objects. * Java Program to find first and last elements from Java ArrayList. You can see that our program has correctly retrieved first and last element from the ArrayList in Java. That's all on how to get first and last element from ArrayList in Java. 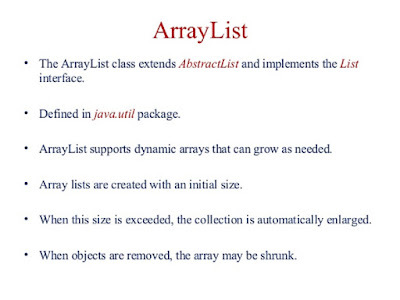 Java Collection API does provides method to access ArrayList elements by index, these methods are actually defined inside List interface.